Example of a (complete) 'simian line': a complete fusion of the heart line and head line - which usually results in the impression that one of both lines appears to be missing! What do we know about the 'simian line'? Well... actually, quite at lot! 1 - The 'simian line' is usually recognized as a fusion between heart line and head line. 2 - The 'simian line' is more often seen in various populations (including: men & asians). 3 - The 'simian line' is in medical science a.k.a. 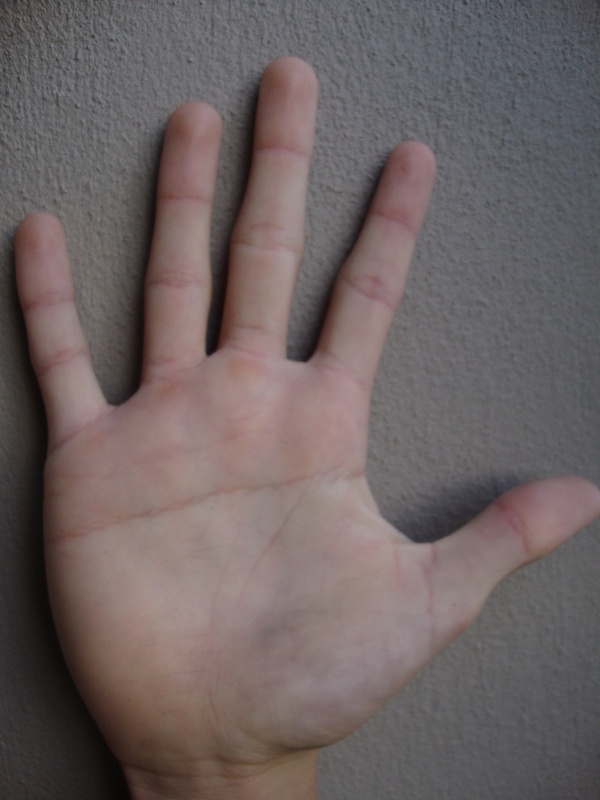 as: the single palmar transverse crease (or simian crease); and it has been recognized as a minor physical anomaly, which is especially well known for it's significance in Down's syndrome*. * But the simian line has been linked with many other syndromes, diseases & certain psychological issues. Because while the classic variant is relatively easy to recognize, it can manifest in many variants!! Basically, one can discriminate a 'complete simian' from a 'incomplete simian line'. 'Can a 'complete simian line' have different implications than an 'incomplete simian line'? Anyway, while there is litte evidence to answer this question permanently... in a recent study I discovered that this may indeed be true!! Below I will describe my discovery by describing 2 observations that I made with the assistance of the 'PIC model' (which concerns a 'too' for classifying the major characteristics of the three palmar lines: life line + heart line + head line). The 'complete simian line' is far les common than the 'incomplete simian line'! Overview of the 3 most common simian line variants: PIC 211, PIC 311d and PIC 321d. The 'complete simian line' is often seen in Down's syndrome! Down syndrome is well known for having a very large occurence of the 'simian line', a study in 19 cases of Down syndrome revealed that the 'distal disconnected simian line' (PIC 311d) was not observed at all! While the 'complete simian line' (PIC 211) was relatively common (21.0%), and the 'distal simian line' (PIC 321d) was even more common (23.7%)... one other usually more rare simian line variant was rrequently observed (7.9%): the 'distal simian-Sydney line' (PIC 322a+d) - see the picture below! PS. I think the results for the 'distal simian-Sydney line' perfectly makes sense in the perspective that the 'Sydney line' is also a typical hand characteristic of the hand in Down's syndrome! Re: Simian line: advanced considerations! I am prepairing to present more 'PIC-model' results for other interesting populations, such as: for people who have an high IQ, autism, dyslexia, and for people who display typical personality characteristics (according the Big Five personality model). So, I wouldn't be surprized if afterwards I can present more specied details about the occurence of various simian line variants in those populations!! I hope this sounds like an interesting perspective!? 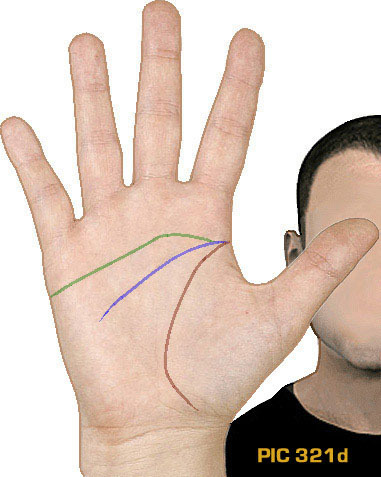 Combined with the 2 populations that I already mentioned in my earlier post (19 people who have Down's syndrome + 400 people from the general Dutch population)... an interesting perspective has been established to study the basic idea that the three major hand lines might provide a clue about the Intelligence Quotiënt of individuals. 4) Down's syndrome = low IQ. ... which appears to correlate HIGHLY with the I.Q. (intelligence) of individuals!! New results indicate that regarding the core patterns of the 3 major hand lines, asymmetries between the right hand and the left hand turn out to be a very significant factor that correlates with... the basic intelligence (IQ) of individuals. While judging the significance of a simian line, it is very important to consider as well the related-differences between the right hand and the left hand! "... various studies have indicated that the simian line is usually more frequently observed in the left-hand (1.3%) - compared to the right hand (0.8%)." Basically, this implicates that hands show often a natural tendency towards simian line asymmetries!!! Secondly, the study of the simian line results in the 4 groups has revealed that 'right hand versus left hand' differences (R-vs-L) are a key-factor in how the simian line correlates with IQ. While small 'R-vs-L' differences are relatively unimportant (because they can be observed in about 1/3 of all people), a combination of 'R-vs-L' differences is much less common... but much more signficant in the perspective of the correlation between the simian line and (low) IQ. Actually, certain combinations turn out to be observed only in the populations that are known to be featured with below average intelligence usually!! These percentages clearly indicate that any 'simian line variant' in the right hand, combined with the most common hand line variant (PIC 310) or a 'Sydney line variant' (PIC 301a, PIC 311a, PIC 312a+b, PIC 312a+d or PIC 322a+b)... is much more likely found in a person from a population that is not known for having an above average 'Intelligence Coëfficient'! ... Now, beyond what I just described - I already have identified how MULTIPLE ASYMMETRIES can help to find even more signficant results. But to describe that more complex topic ( ) requires me first to design a new PIC model tool that should become helpfull to identify the more complex asymmetry variants between the right hand and the left hand!!! PS. I realize that what I have presented so far in this discussion is rather technical, so I already have designed a plan to write a much more simple article about how the major hand lines appear to correlate with intelligence! NOTICE: Picture above is just a nice illustration for fun! While 'complete simian lines' are more common in the left hand, a 'complete simian line' in the right hand appears to be more significant regarding intelligence! Literature studies confirm that for example simian lines in the right hand combinated with relatively normal hand lines in the left hand are typical for in Down's syndrome. While the reversed combi (simian line in left hand + normal lines in right hand) is a much more normal asymmetrical combination! ... I think OBSERVATION 4 should be quite easy to understand! Correct? Buddha statues often often show an (incomplete) simian line! "... The absence in their otherwise realistic sculputure of creases and lines indicates that the ancient Greeks were uninterested in palmistry. In contrast, in Indian and other oriental Buddhist sculpture, creases and lines are rendered clearly and in different ways to represent the characteristics of the particular Buddha: strong and vigorous for powerful masculine figures and gentle and romantic for feminine ones. The presence of lines and creases on the palms of such Buddhist statues is less widely recognized. In general, there are three patterns of creases, as shown in fig.1 [see picture above]. 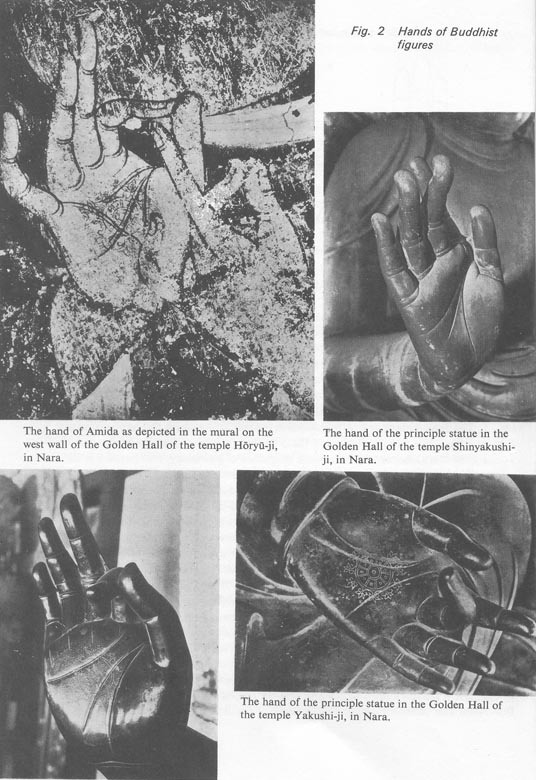 The most common is pattern A, which is found on the hands of many Japanese Buddhist statues, including the colossal Vairocana Buddha of the temple Tõdai-ji, in Nara. According to ancient doctrines of palmistry, this pattern is the most noble possible to human beings and an attribute of kings. Using it on sculpture representing them means that Buddhas are the most loftiest and most ideal form of humanity. In Japan, this palm pattern occurs in no more than seven out of every one hundred people and is often found in members of families of genius." 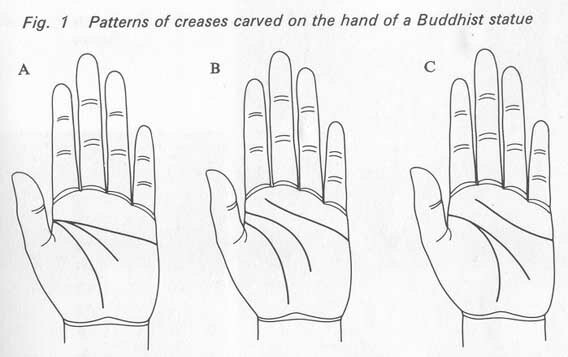 In the perspective of the Buddha sculptures, it is interesting to notice that the most common Buddha hand line type exactly relates to PIC type 321d (which is among Dutch people the most common simian-related hand line variant: observed in 5.25% in a population of 400 Dutch people - see table 1: http://www.handresearch.com/diagnostics/hand-line-studies-formations-in-lines.htm ). But contrary to what is described by Asano about the Japanese population, this 'Buddha' hand line variant was less frequently found in sample of university students (4.17%). So, this suggests that also this 'Buddha' hand line variant should not be associated with a high IQ. Thanks Martijn for these informative studies! thank you: An interesting case. I'm looking forward to further studies - specially for the last formation, the heart line going down to the head line start. May be it would be interesting, which SL - in the left or right - has more effect on the whole life and on which part of the biography - childhood/youth, early or later adulthood. zaobhand wrote: Thanks Martijn for these informative studies! I have started working on the development new model which also considers the 'splittings' in the heart line; and I am sure that later I will be able to report more details about that specific heart line variant. Regarding left vs. right, I have noticed a major difference regarding the significance of the Syndey line (more 'troublesome' when present in the left hand) and the simian line (more 'troublesome' when present in the right hand). But it might take a few more weeks/months before I can report more details. re: The simian line - advanced considerations! When I saw the mention of Buddha I was at once skeptical of what Asano was showing. Given that Buddhism did not arrive in Japan for at least one thousand years after Buddha's time, any statue in Japan would likely have no basis for comparison. That is, no model. And, I have looked at many statues of the Buddha and note that some have very rudimentary depictions of palmar lines. So, I did a little digging as I knew that the physical characteristics of the Buddha are actually well documented. Netlike? Wow! I cannot even imagine what that looks like. excellent Martijn, that is very comprehensive & interesting simian line info. Lynn wrote: excellent Martijn, that is very comprehensive & interesting simian line info. Teşekkürler Lynn (thank you), nice to hear that you like it! PS. I have additonal plans: because in the future I hope to present some kind of skedual with the purpose to give a quick impression regarding what is required for a simian line to become indicative for various specific chromosomal- and psychological conditions. Amazing and so ,so interesting. 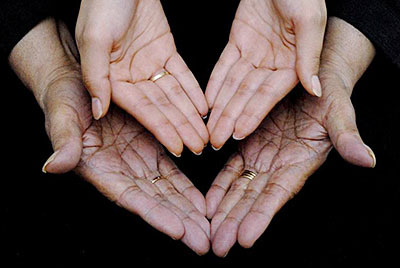 Did you find out the significance of complete simian lines on both hands. jeanette wrote: Amazing and so ,so interesting. Thanks Jeanette, great to hear that you like it. Regarding your question, I think the principles are rather simple: a simian line in both hand has basically a stronger impact than a simian line in only one hand, and a complete simian line likely has basically a stronger impact than an incomplete simian line..
And I could add that so far I have not spotted any consistent tendencies for a single simian line in the right hand or left hand. 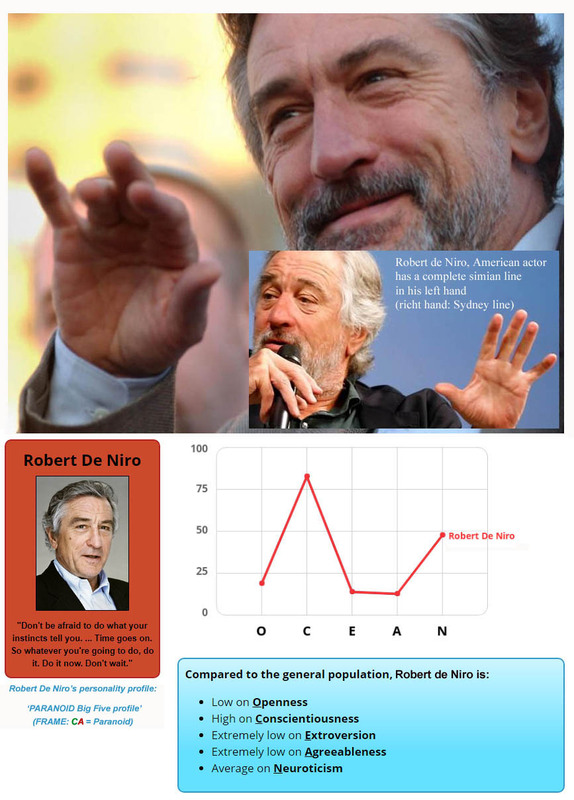 Robert de Niro's Big Five profile shows that according his "public image" he is recognized to have an introverted personality. 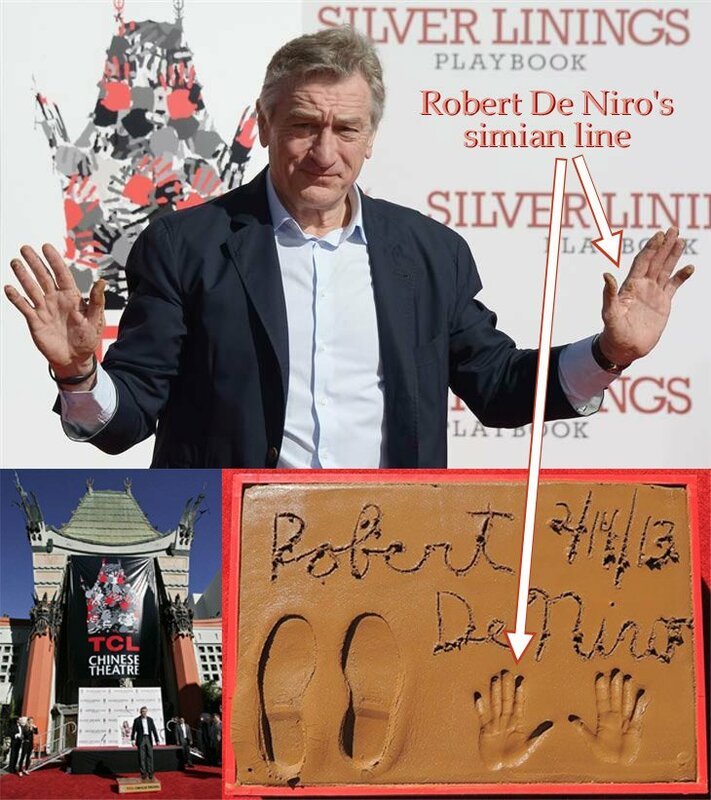 Simian line: Big Five personality profiling - including Robert de Niro's simian line & Big FIve profile!